The Sony PS4 has a safe mode that starts the system with only essential services. This safe mode feature is typically used when you are having problems with your device. Additionally, these directions can be used if you want to factory reset the device and delete all user data and settings. Safe Mode on the PS4 is meant to be used when you cannot access the XMB or if you are having other serious issues. I consider it a last resort when troubleshooting; hopefully, you will never have to use it. 1. Power off the PS4 by holding down the power button for several seconds. You will hear a beep and see the power light turn red. 2. Power on the PS4 by holding the power button down and keeping it held down. You will hear an initial beep when you press the power button. Wait about 7 seconds until you hear a second beep. 3. Once you hear the second beep, release the power button and the Safe Mode screens should appear. You will need to connect your DualShock 4 controller via a USB cable to the PS4 since Bluetooth is not active when in Safe Mode. 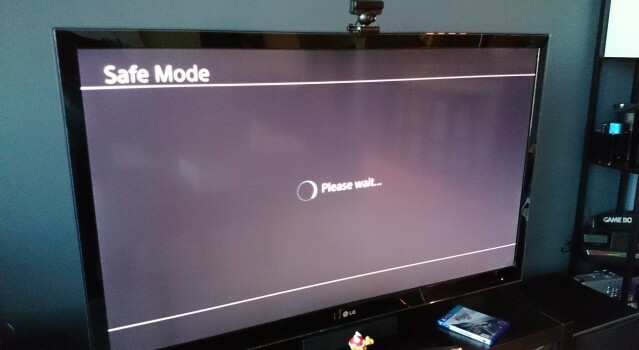 Restart System – Exits Safe Mode and restarts the PlayStation 4 back into the XMB. Initialize PS4 – All data and settings will be lost by performing this step. This deletes all user data and restores the PS4 to as if it just came out of the box. This option is the same as the [Initialize PS4] option in the Settings menu. System software or firmware is not deleted from this option. Essentially, this will erase all your personal data and restore to a factory reset. Initialize PS4 (Reinstall System Software) – This deletes all information on the HDD including the System Software. A message that states a USB storage device containing the System Software must be connected is displayed. Then you can confirm the selection. This too is a factory reset mechanism, but it requires reinstalling the system software as well.